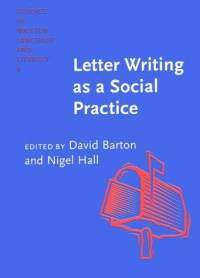 While I was searching for an interesting topic for my paper, I came across a book named Letter Writing as a Social Practice. I am interested in the Clift family letters and I explicitly want to focus on William Clift’s written interaction (and language variation) with his eldest sister Elizabeth and his other siblings. Frances Austen has also written an article for this book named Letter Writing in a Cornish Community in the 1790s. She starts her article by providing some revelant background information about William Clift’s childhood and eventually shifts the attention to the written correspondence among William Clift and his siblings. According to Austen, “the Clifts possessed rather more than merely ‘functional literacy’, if by that is meant writing merely to ascerta in the health and welfare of family members and to assure them that they were not forgotten” (2000, p. 58). In addition, this book also contains articles on topics such as pauper letters, children’s letters and letter-writing in America. Austen, Frances (2000). “Letter Writing in a Cornish Community in the 1790s”. In: David Barton & Nigel Hall (eds.) Letter Writing as a Social Practice. Amsterdam: John Benjamins. 43-61. This entry was posted in 18th-century letters, 19th-century letters, letter writing. Bookmark the permalink.